Yes! My Word, the Scriptures. Read them, study them; store them in your hearts, use them as you use a lamp to guide your footsteps. But remember, My children, My Word is more even than that. it is the Voice that speaks to your hearts, that inner consciousness that tells of Me. It is the Voice that speaks to you intimately, personally, in this sacred evening time. It is even more than that. It is I your Lord and Friend. “And the word was made flesh and dwelt among us.” Truly a lamp to your feet, and a light to your path. Some of my Higher Further Deeper experience.. When ever I’m alone, which I’ve been most of this morning, I’m off and on crying, my inner child I think, “why did you take me away from that place (the community) where I felt so cozy”. I’ve smiling tears even as I type that. I had a dream a few nights ago, I was in the box at City Church talking to someone saying “I just can’t do it, I have to come back”………….all this and yet I firmly believe I’m to be here right now. So the inner emotional pull is well, emotional…but that’s not what I’m to focus on. Yes have my feelings but “Be still and know that I am God”. It’s an inbetween place that I’m experiencing. I suppose all of life is really, A series of changes and challenges no matter where we reside. To live ‘in the moment’, not looking too far ahead or behind (as we are taught), secure in the knowledge that, being one of the King’s kids, He’ll unfold things and I’ll know when I know what I need to know as I ask Him to continue to show me the way…as it did happen for me to make this move. Well, my Mother is gone into Vernon for the day and I’m to pick up my Step Father from his Thursday day program, he’ll be pleased I’ve come to get him early..My Mother is attending an alzheimer’s meeting with my brother. I asked her to come home with as much literature as she could get her hands on. Loving the Church does not require romantic emotions. It requires the will to see the living Christ among his people and to love them as we want to love Christ himself. This is true not only for the “little” people – the poor, the oppressed, the forgotten – but also for the “big” people who exercise authority in the Church. To love the Church means to be willing to meet Jesus wherever we go in the Church. This love doesn’t mean agreeing with or approving of everyone’s ideas or behavior. On the contrary, it can call us to confront those who hide Christ from us. But whether we confront or affirm, criticize or praise, we can only become fruitful when our words and actions come from hearts that love the Church. We will have a free draw on Dec 15 for this rug. Please come join us at the church on Sunday (Mass @2pm) or Thursday (Praise starts at 7:30pm) give a donation for Peru and get a free draw ticket. For those far away who can’t come to the church, use the Donation button on our site and just put in the comments box you want to support Peru mission. When we were on mission in Peru in August of this year we visited the prison in Huanuco. We found some of the prisoners working on rugs. There was an artist there and he trained some to do this beautiful work. They would hook the rugs, trim them and in the end would brush them and they would become very soft. 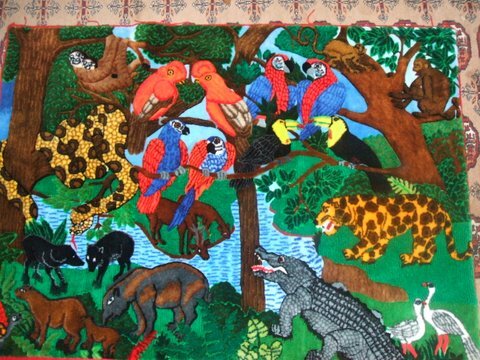 This rug is of wonderful colorful jungle animals that you would find in Tingo Maria, just a couple of hours away. Children would love it. A great Christmas gift as well! We paid for the rug US$100. This is in Peru where labour is cheap and in a jail where labour is even cheaper. There are many hours of work, hope, faith and love in the rug and that gives the rug its real value. Done in a jail by interns that have no other mean to raise a bit of money for basic needs (soap, phone calls, tooth paste, food, etc.). Would be great to recuperate at least that so we can use it in turn to continue blessing people that are in the vicious circle of poverty. The colors are bright with animals from the Peruvian jungle. You are currently browsing the Lift Jesus Higher blog archives for October, 2009.